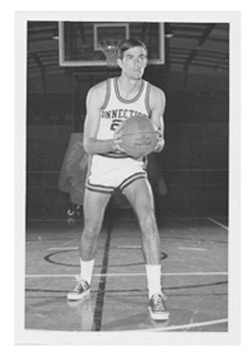 Jim Jachym was a Forward for the UConn Huskies from 1968 – 1970. 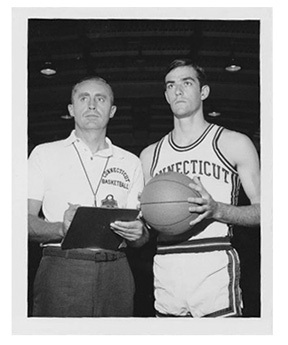 He was a member of former basketball Head Coach Dee Rowe’s first team at UConn, which was voted the Most Improved Team in New England, and won a Yankee Conference Championship. Jim was a two-sport athlete, recruited by UConn primarily for baseball and secondarily for basketball. I met Jim in February 2010, as he reflected on his collegiate and post-collegiate sports career memories. “I came from a very athletic-orientated family. My father played basketball and baseball at the University of Notre Dame. 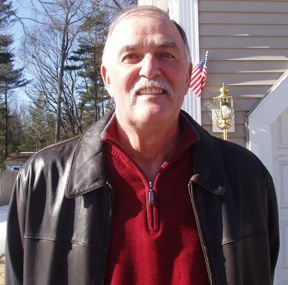 He was with the Major League Baseball Detroit Tiger Organization, and coached for years in Westfield, Massachusetts.” Jim and his two brothers played multiple sports in local youth leagues growing up, and his sister was a cheerleader. While at Westfield High School, Jim set the all-time leading scorer record in basketball with 1,204 points, which has not been broken to date. He made the All-Western Massachusetts Team, and in his senior year the team made it to the semi-finals in the Western Mass Tournament. Jim was also a pitcher for the baseball team. His greatest memory from the baseball team was during his junior year when his team won the State Championship. Jim also enjoyed, in his senior year, going to the college World Series, pitching the first game, and shutting his opponent out for nine innings before getting relieved. His team went on to win the game in the twelfth inning. Jim was being recruited for college by Arizona State University, UMass, Springfield College and UConn for baseball. It was Andy Baylock, (UConn Head Baseball Coach at the time) who impressed Jim. “When Andy came to my house and spoke to me, it was all about education, and being more than just a player, being a person. To me, Andy is very similar to Dee Rowe, they come from the same mold.” Jim told Coach Baylock he was also interested in playing basketball, and soon UConn basketball Head Coach Burr Carlson (at the time) went to see one of Jim’s Westfield High games. Jim went for a visit to the UConn campus and liked the location. It was in the country, but not too far from the city. Jim liked the school, and his parents liked Coach Baylock, too. Jim made his decision to go to UConn on a baseball scholarship, and would also be a player on the basketball team. Jim also spent three or four summers working and learning at Coach Auriemma’s summer basketball camps. “Geno is a great guy, and a lot of fun. He’s always accessible to the kids. The number 12 player at camp was as important as the number one player.” Each summer Jim runs his own summer camp for baseball, and also a girl’s basketball camp where he applies a lot of what he learned from Coach Auriemma’s camps. Jim met his wife, Eileen, while he was teaching and she was a substitute teacher. She is now the principal at North Middle School in Westfield, MA. They were married in 1979, and have two children Joey age 26, Kristin age 29, and a grandson Jake age 7. Kristin went to UConn for two years playing on its Lacrosse team, but suffered an eye injury. She transferred to Westfield State University where she earned her Bachelors Degree. Joey also graduated from Westfield State where he played baseball. Jake is already learning to be a pitcher (left handed like Jim). Jim retired from teaching and coaching a few years ago but continues to be a substitute teacher, run his summer camps, and does some scouting for Westfield baseball, and basketball teams.